New Listing! 41’ Van der Heijden 2018 with less than 20 hours on engines! : Atlantic Yacht & Ship, Inc.
New Listing! 41’ Van der Heijden 2018 with less than 50 hours on engines! Since 1993, Van der Heijden Yachts have been produced just South East of Rotterdam, in the Netherlands. Originally, Ronald Van der Heijden was the propulsion engineer for the Royal Dutch Navy. He decided to venture out on his own to start building custom yachts. So far, he has manufactured over 420 vessels for clients all over the world. The vessels are built to class A certification and ocean going CE. Given these points, lets discuss our new listing, a 41′ Van der Heijden 2018! The 41′ Van der Heijden 2018 is a compact yacht but with astounding spaciousness. She is a Hayden model with Hard Top. Advanced modular building techniques with light weight aluminum allows for tremendous strength and incredible performance. She is in new condition with less than 50 hours on twin Volvo Penta 300 HP diesels with warranties. The cockpit features a massive U-shaped seating area for 12 with hi/low pedestal table. Across to starboard is a wet bar with refrigerator, sink, and grill. The contemporary exterior easily blends with the interior of the yacht, with the right form and materials for furniture and upholstery. The Hayden breathes a sense of flow you will love. She has a 2 stateroom/2 head layout. The salon gives a sense of an open and airy environment with its huge windows bathing the space in natural light. Captain and guest benefit from a 360° unobstructed view of their voyage. Contact Gregg Silver at Atlantic Yacht & Ship, Inc. for a private showing on the 41’ Van der Heijden 2018 located in Miami Beach, Florida. For over 56 years Atlantic Yacht & Ship, Inc has been serving the yachting community. Our headquarter sales office is dockside at Harbour Towne Marina in the heart of the yachting capital of the world, Fort Lauderdale, FL. Our in-house waterside service department provides general yacht services. This includes from new teak, to engine rebuilds, captain services, and everything in between. Whether purchasing or marketing a quality vessel, Atlantic Yacht and Ship, Inc. is your one stop resource for the highest quality service and sales in the yachting industry today. If you are looking at yachts for sale, or thinking about selling your yacht, it is always wise to have an experienced broker representing your interests throughout the deal. Contact Atlantic Yacht & Ship, Inc. at 954.921.1500 or click here. Brand new condition and low hours on this 44′ Zeelander 2014! New listing! 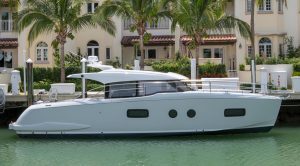 56′ Carver 2007 a turn key vessel in incredible condition! Palm Beach International Boat Show 2018 Wrap Up!